Kosher? That means the rabbi blessed it, right? Not exactly. In this captivation account of a Bible-based practice that has grown into a multibillion-dollar industry, journalist Sue Fishkoff travels throughout America and to Shanghai, China, to find out who eats kosher food, who produces it, who is responsible for its certification, and how this fascinating world continues to eveolve. She explains why 86 percent of the 11.2 million Americans who regularly buy kosher food are not observant Jews-they are Muslims, Seventh-day Adventists, vegetarians, people with food allergies, and consumers who pay top dollar for food they believe "answers to a higher authority." Fishkoff interviews food manufacturers, rabbinic supervisors, and ritual slaughterers; meets with eco-kosher adherents who go beyond traditional requirements to produce organic chicken and pasture-raised beef; sips boutique kosher wine in Napa Valley; talks to shoppers at an upscale kosher supermarket in Brooklyn; and marches with unemployed workers at the nation's largest kosher meatpacking plant. She talks to Reform Jews who are rediscovering the spiritual benefits of Kashrut and to Conservative and Orthodox Jews who are demanding that kosher food production adhere to ethical and environmental values. She chronicles the corruption, price-fixing, and strong-arm tactics of early-twentieth-century kosher meat production, against which contemporary kashrut scandals pale by comparison. 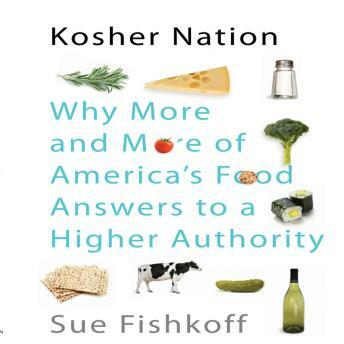 A revelatory look at the current stat of kosher in America, this audio book will appeal to anyone interested in food, religion, Jewish identity or big business.